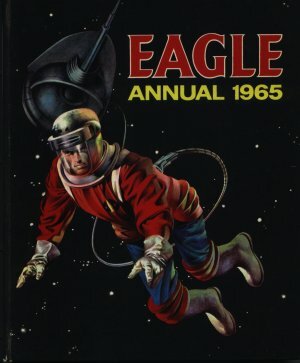 Eagle Annual 1965 gets smaller with less pages than previously, and has no engineering, science or nature sections. Even one of the Dan Dare stories is no longer in colour. Is this the beginning of a decline? Dimensions : 21cm x 26cm with 160 pages. Was Christopher Marlowe murdered? Find out here. Dan Dare sees Fire in the Sky! See if you can Catch A Crook, again? Flying Saucers. Fact or Fantasy?